Who eats orange—a chicken? A bunny? A bear? Find out in this unique exploration of colors and animals’ favorite foods. Animals eat a rainbow of different foods. Gorillas in the mountains eat green, octopi in the ocean eat red, and toucans in the canopy eat blue. Young animal enthusiasts will love digging into this lively journey around the world to explore the colorful diets of many animals, from the familiar to the exotic. Dianne White lives in Gilbert, Arizona, with her family. 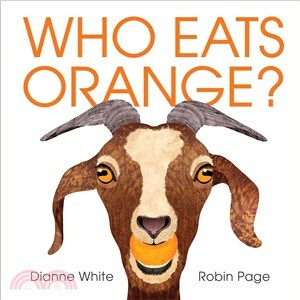 She is the author of Who Eats Orange? and the award-winning picture book?Blue on Blue. Robin Page has written and illustrated several picture books, including the 2003 Caldecott Honor recipient?What Do You Do with a Tail Like This?, which she created with her husband Steve Jenkins, and A Chicken Followed Me Home! and Seeds Move!, which she both wrote and illustrated. Robin and Steve live in Boulder, Colorado.